After a vacation, it always takes some doing to get back in that daily routine. Especially with the homeschooling aspect, the post-vacation recovery feels a little bit like righting a ship that’s listing hard to starboard. First there’s just getting the house in order & caught up with laundry and then there’s the getting the sleeping & waking schedules back on track, nudging the kiddos back up to speed in completing assignments, and just generally getting everyone back in the rhythm of our daily life. I’m happy to say that after a week and a half, we’re almost there. 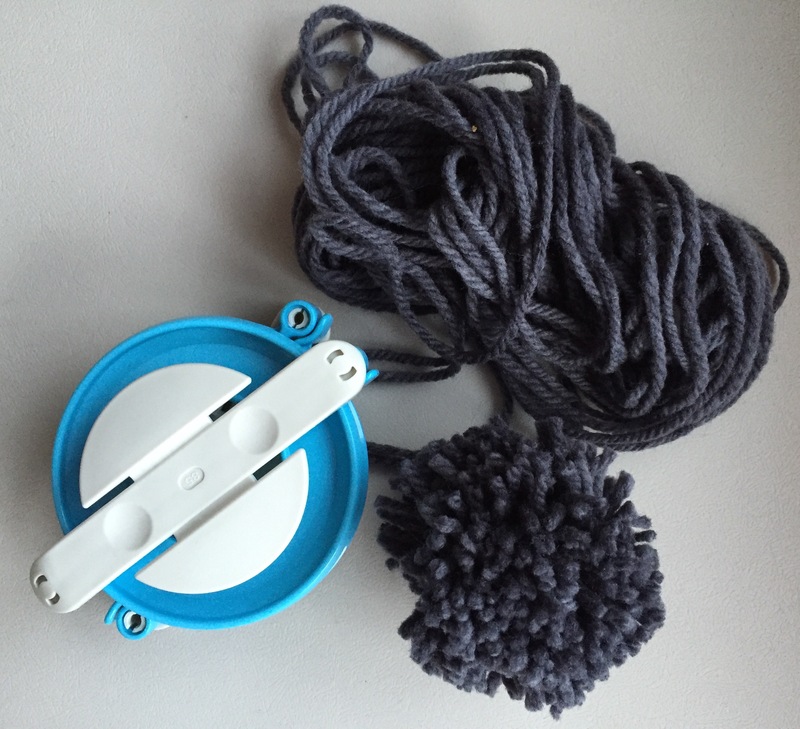 For all the slow-pokedness and feet dragging, though, I will admit that I’ve managed to get a fair bit of knitting and spinning done. 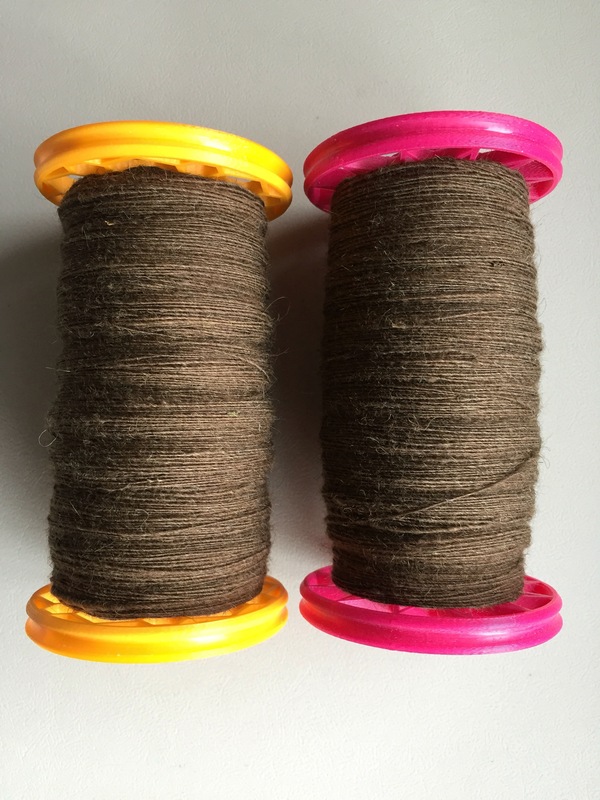 I finished up my vacation singles from Wolf Ridge Lamb & Wool Co. In wanting to let them rest before plying, I had a bit of a conundrum. With new fiber on the way from Three Waters Farm for the Completely Twisted and Arbitrary SAL, should I wait for it to arrive or attempt to spin something up quickly in the interim? Figuring that the fiber — which is shipping from North Carolina — would probably be a bit delayed thanks to Snowzilla, I thought it only appropriate to spin up “Cool Conundrums,” also from Three Waters Farm. I also took the opportunity to try to get to know my new Very Fast Flyer that I got for my birthday. 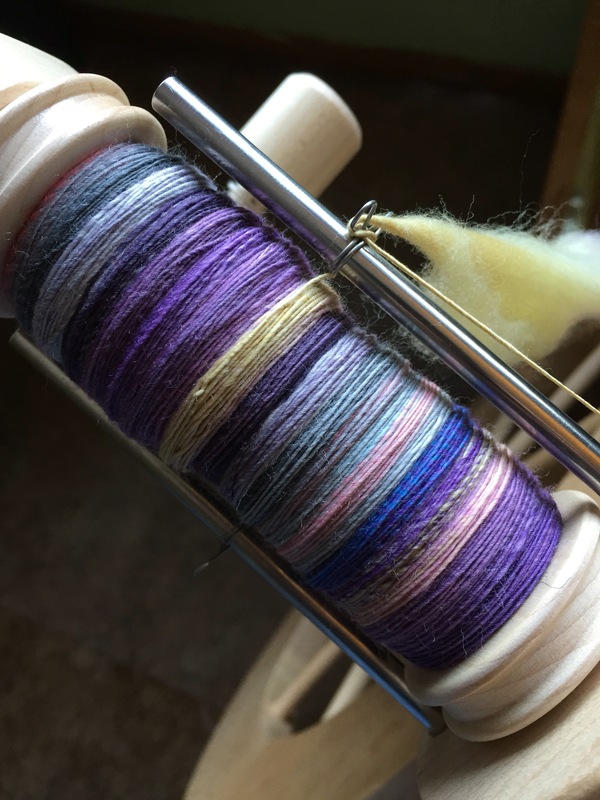 Beyond just getting used to the speed — as the name indicates, it’s pretty fast — I wanted to get an idea for how much fiber will fit on the bobbins, if it changed how quickly I could get through a project, etc. I’m approaching the threshold where I’m not just hanging on for dear life and am actually getting a good feel for how to create with this new tool. And for a first attempt with this flyer, I’m still hopeful that the yarn will turn out decent. I’m about three-quarters through the fiber and hope to wrap up the singles today so I can get at plying soon. I was working on this as part of the Three Waters Farm Susan Ashcroft SAL + KAL and was impressed that this pattern was not only memorize-able and highly addictive. I’m still waiting on my Agnes Sweater to dry (it’s being stubborn and slow) so I can block it, but I’m hopeful the proper FO pictures won’t be too far off. in order to make a topper for my Timber Bay hat. I’m a little concerned the pom isn’t big enough — I had a real behemoth in my mind’s eye, I guess — but I actually ran out of yarn, so it’s going to have to do. I’ll get some photos of the finished hat soon so you can have a look. AND, the last couple days Mr. Knitting Sarah has been deathly ill with the flu, so yesterday I spent some time just hanging out and resting with him. 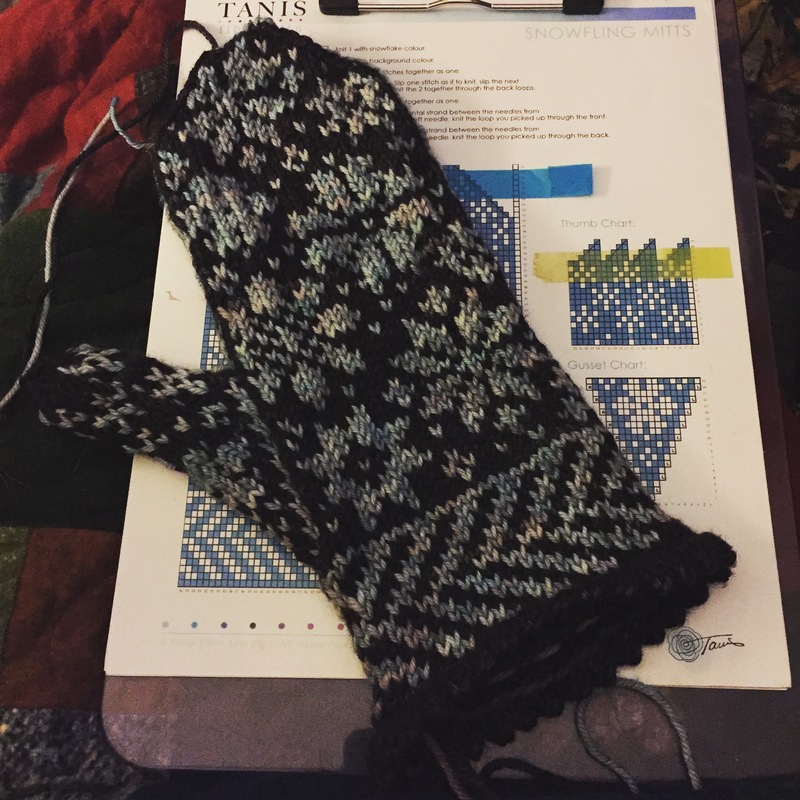 While relaxing, I went ahead and started my second One Plus One Plus One project — my Snowfling Mitts. 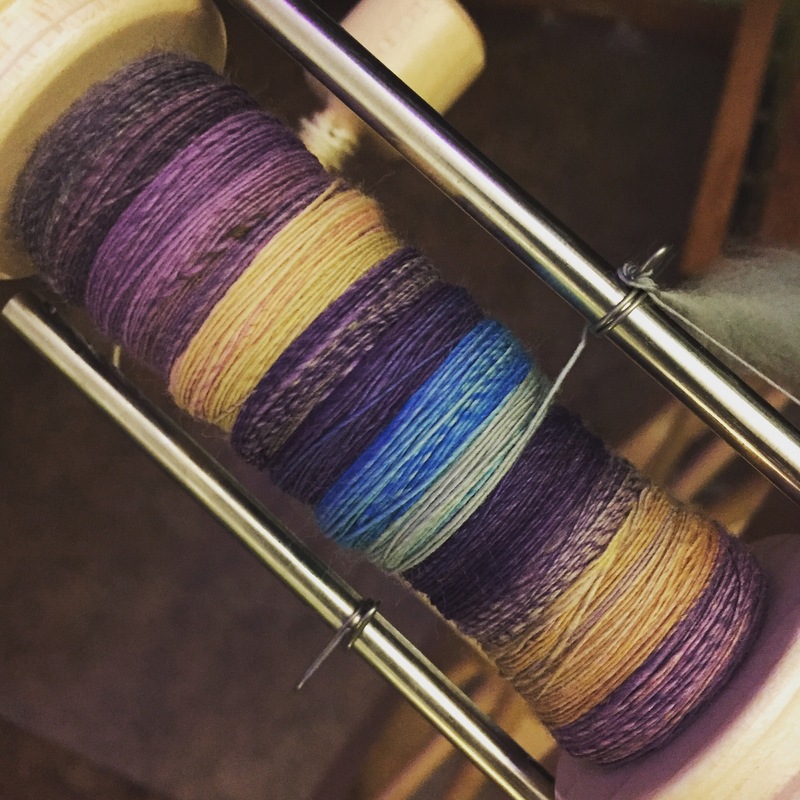 If you’ll remember, I got the yarn up at Spin of Door County for my birthday — it’s Tosh DK in Cloud and Leopard. 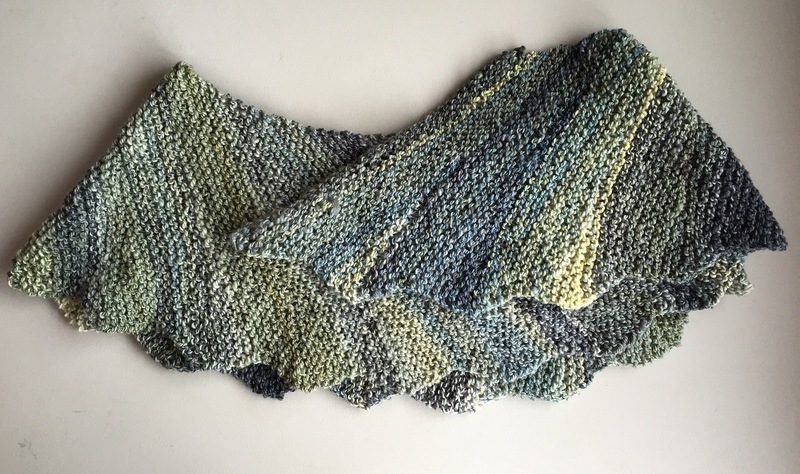 Against pattern instructions, I went ahead and used the background color for the picot edge. I like how they look, but if I’m being honest it’s also so they don’t show dirt as much. What can I say? I’m outside a lot and I’ll be wearing these outside a lot. I couldn’t put them down and I finished the whole outer right mitten last night, including the thumb, before going to sleep. 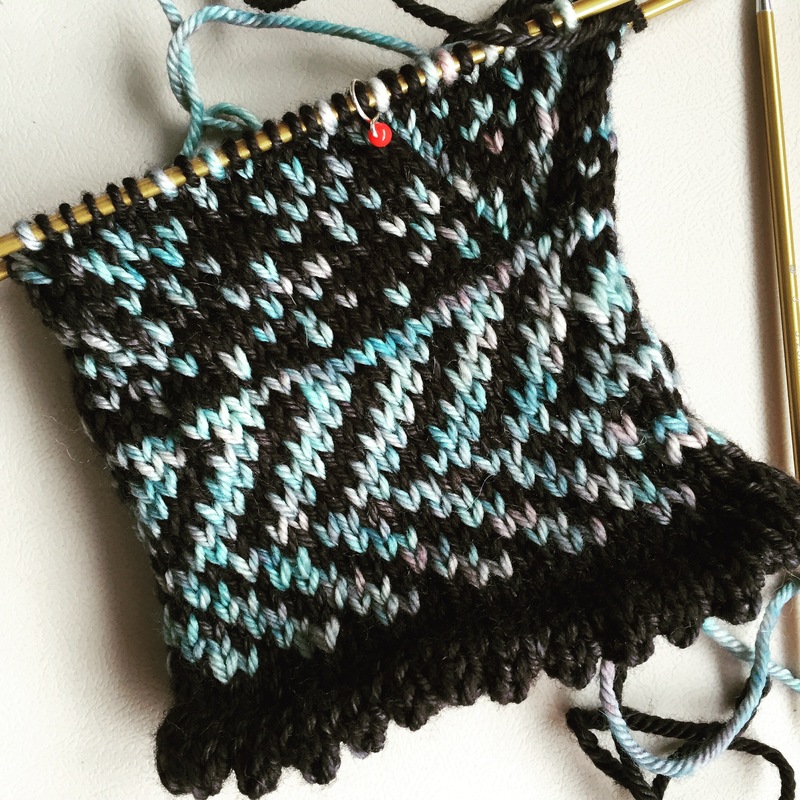 I have serious “can’t-put-it-down” issues with colorwork. There’s are worse things in life than not being able to set down colorwork. In any case, I’m going to whip up the left mitten and then move on to the linings. And with that, it’s time to start our day. I’ll be making valiant efforts to stay on track, right this ship, and plow through today’s lesson plan. And I’ll probably sneak some time for a certain colorwork mitten, too. It’s all those little moments. And a couple nights where my hubby went to sleep early because he was sick. And luck? LOL! I have no idea, honestly, some weeks are more productive than others!